This exercise is mainly focused on the quadriceps and can be used with either a kettlebell or a dumbbell. It is an intermediate exercise used for gaining strength. Start with your feet shoulder-width apart and a kettlebell between your feet. This will be your starting position. 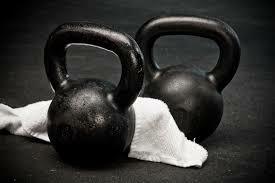 Bend at the knees and squat down to pick up the kettlebell by the horns or handle. Keep your back flat, hips back, and core braced. Extend through your knees and hips and bring the kettlebell up to your chest before quickly dropping down into a squat. At the bottom of the squat your knees should be at 90 degrees, your elbows stacked on your thighs, and your core engaged. Stand back up from the squat, keeping the kettlebell close to your chest, then lower it back down to the ground, returning to the starting position. This is one repetition. Continue for the recommended number of repetitions or time.